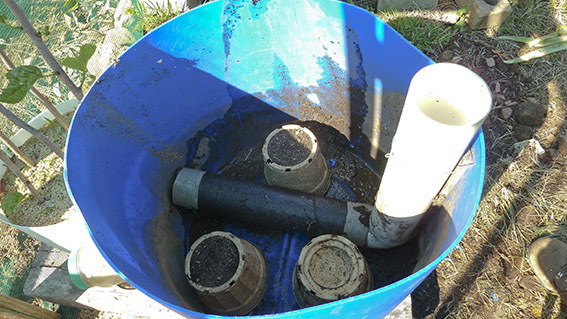 We first started to investigate wicking pots during a seven-year drought we experienced between 2001 and 2008. At that time we were dependent on one 3,000 gallon tank for all our water needs, including the garden, though we were recycling treated greywater to the fruit trees for part of that time. The theory behind wicking beds is simple. Water will generally wick up most soils to a height of around 300mm. So if water is supplied to the plants via a reservoir under the soil layer, then it will wick up the soil, and if the soil surface is more than 300mm above the water then the surface will not be wet, and there will be little or no evaporation. Thus the only water that should be lost is what passes through the plants by transpiration. Because this was a bit of an experiment we decided to try it first with pots, before moving on to a wicking bed, though we did make the base for the wicking bed at the same time we made the first wicking pots. My first impressions when I thought about the design of wicking pots / beds was that it seemed like the perfect situation for creating anaerobic processes (i.e. without oxygen) that could result in some pretty horrible smells, not to mention bad impacts on the plants. The first design had a drain approximately 100mm above the bottom, so that excess water (e.g. rain, or forgetting to turn the hose off when filling the reservoir) didn’t flood the roots of the plants for too long. Just in case this drain got blocked or could not cope with the heavy storm rains we get from time to time, another drain was added above this. 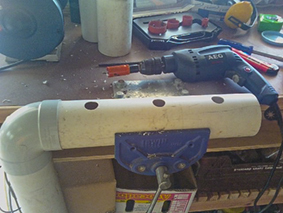 The recharge pipe is made from some off-cuts of 90mm downpipe and a spare elbow, with holes cut in the bottom to allow an even distribution of water. The bottom section was then wrapped in weed mat to keep soil and roots from getting into the pipe. Before the pot was filled with the intended medium a test of its wicking capacity was done using some cut-off soft drink bottles – the wicking height was pretty close to 300mm. For the first trial I filled four pots with a sandy loam with a good amount of compost and some coconut coir fibres to increase the water retention capacity. Early results were very encouraging. Plants thrived, and on hot days when the same plants in adjacent non-wicking pots were wilting, those in the wicking pots were showing no signs of stress. But then, after about four weeks, things started to go wrong. Leaves of tomatoes and basil started to lose their rigidity, going a dark green colour and “collapsing”. Those species that didn’t show these symptoms just failed to thrive. I removed the plants from one pot and dug out the soil. Before I got to the saturated layer there was a very strong smell of rotten eggs. Hydrogen sulphide – the tell-tale sign of anaerobic processes. When I did get down to the saturated layer I was surprised to find some areas of shiny black soil – pretty clearly some kind of metallic sulphide deposit, and a sign of extreme anaerobic processes. Much worse than my early misgivings had led me to expect. What to do? Clearly there were likely to be two aspects to the problem – a primary cause: no, or too little, oxygen was getting to the saturated layer; and a secondary cause: too much nutrient in that layer, leading to rapid consumption of any oxygen that did reach the saturated layer. I’d been reading about water treatment processes and about biochar at the time, and both of these mentioned the way in which the capillaries in charcoal provide habitat for an amazing range of organisms that consumed excess nutrients as well as promoting healthy soil. 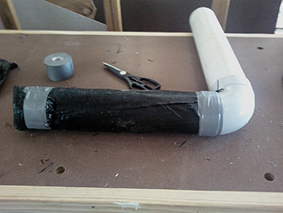 Maybe charcoal would make a good medium for the saturated layer, and could possibly be combined with a routine of regularly changing the water in this layer so as to drain away any developing anaerobic products. But what about stopping nutrients from moving into the saturated layer? Adding plant food at the top of the soil layer wouldn’t meant that it would find it way to the saturated layer, or at least not in large quantities. And if water could be prevented from moving downwards then there would be less likelihood of downward nutrient movement. 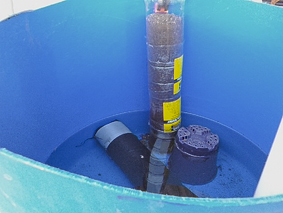 Possible solution: Keep the reservoir full, only provide plant nutrient at the top of the soil layer and water it in only after the reservoir had been filled. Draining the reservoir every few weeks (add another drain with a tap at the bottom of the wicking pot) should help prevent an anaerobic situation from getting out of control. But why don’t most other people seem to experience this problem. 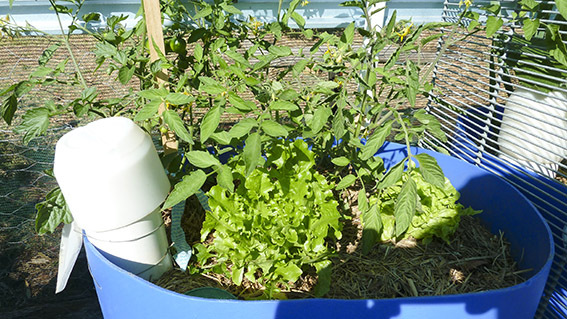 I suspect that it is because the surface to soil volume ratio in the plastic barrels I am using is much less than one finds in, for example, a raised garden bed, a bath tub (often used for wicking pots), or a wicking bed. That higher surface area to soil volume ratio allows more oxygen to penetrate to the saturated layer. Some people do report bad smells – have a look here, and at the response by Scarecrow (who knows a thing or two about gardening generally, including wicking beds). She says: “When I built the in-ground beds I filled the base (‘pool’) area with sand or a sand and gravel mixture. There is little organic matter in these mixtures so there is little to ‘break down’ to cause odours.” So my theory about anaerobic decomposition of nutrient in the saturated layer is probably right. 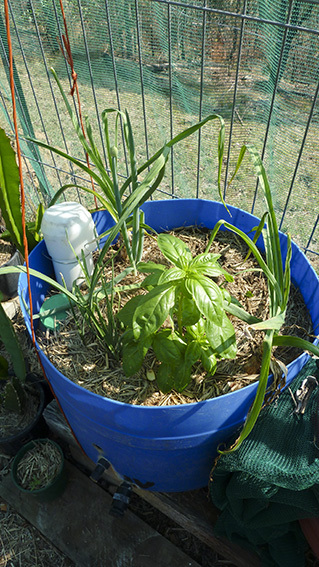 By and large this has been successful, as can be seen by the photo above of the garlic, basil and clumping leek. Does anyone know what the plant in the foreground is in this photo? It was given to me as gai laan (Chinese broccoli) but so many people have told me that it isn’t gai laan I’m now convinced. Some Indonesian friends (who showed me real gai laan to convince me this isn’t it) call it “chi asem”. I can’t find an English name for Chi asem, but I suspect it is non-hearting Chinese cabbage (wombok) [I later discovered that it is Pak Choy]. It loves wicking pots, as do spring onions. Zuccini grows really well too, and flowers and sets fruit, but then the small fruit goes rotten and drops off. Too much water? Wrong pH? In general it seems that plant roots move downward in wicking pots till they reach their optimum level of saturation and oxygen. As you might expect, water plants do particularly well. I’ve currently got water celery (Oenanthe javanica) in a wicking pot and it is thriving. This plant can grow in water or in damp soil, though in water it has a less bitter taste and its “celeryness” is clear. [We stopped growing Water Celery when the extent of its “weediness” became clear]. Kangkung (Water morning glory – Ipomoea aquatica) also does well. In Southeast Asia it grows in damp soil or in water with its stems floating on the surface. Another post on maintaining and rejuvenating wicking pots and using florist pots as wicking pots. 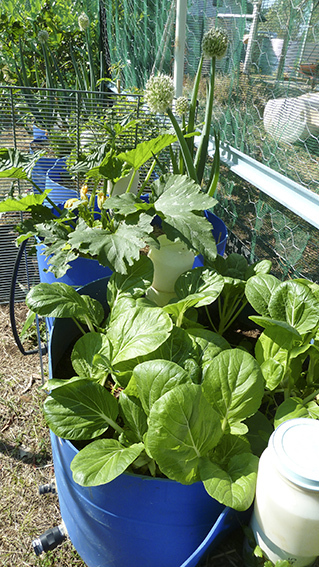 This entry was posted in food production, vegetables, water conservation, wicking beds & pots and tagged plants. Bookmark the permalink. The best wicking material are cotton socks (in my opinion). Regarding the anaerobic condition, it is the anaerobic bacteria that breaks down phosphorus and other elements and makes it bio-available to plants. As wicking occurs through micro pores in the soil, water is oxygenated (due to not having a compacted soil). People over-water and causes the imbalance of anaerobic and aerobic bacteria. There are plenty of nutrients in the soil, but is unavailable due to the imbalance of soil microbiology. Also due to not having enough microrhizome in the soil. The sand medium is wicking too fast and too much water. The speed of cotton socks is very slow and keeps the soil only humid >>> not moist and not wet. Plant roots are negatively charge and will regulated the water suction from the socks and soil. On the other hand, the sand wicks the water too fast and too much, more than what the plant needs. They done research how much do plants really need… and the amount of water plants need is ridiculously small. Why would you use sand as the growing medium rather than soil? It hasn’t been suggested in my posts or in any of the comments so far as I can recall. I’m starting to wonder about your science. “They done research how much do plants really need… and the amount of water plants need is ridiculously small.”?? The amount of water that a plant needs depends on a lot of factors, particularly the size of the plant and the external conditions. E.g. for a large tomato plant it can be more than a litre per day in my experience. Your links to “research” are advertising material for a commercial product and the content of the first video (I didn’t bother to look at the others after seeing this one) is not reporting research results and is not necessarily scientific. E.g. “This allows the development of a capillary water column of around two meter under the waterboxx, copying the natural process of dropping excrement on top of the seed.” (a) is there some connection between “excrement” (does this mean fertilizer or compost or what?) on top of the seed and the capillary water in the soil? The connection escapes me. (b) the height of the capillary column that will/might be created in the soil depends on a lot of factors, not least of which is size of the spaces between soil particles. Can you defend what you are saying, or shall I just delete your comments as click-bait? I’m not sure what you are saying. It is true that in a healthy soil there is a balance of aerobic and anaerobic bacteria and this is essential for the processes that support plant life. However I am not sure how people can “over-water ” a properly constructed wicking bed or pot – the strategically located drain hole(s) will prevent water rising above the drain holes. Nevertheless if there are too many nutrients in the (bottom) wettest layer of the wicking soil I would expect that you could get an anaerobic situation just as a result of the biological oxygen demand, particularly if the horizontal extent of the soil is limited (e.g. a narrow container) or the soil is compacted, so that there is inadequate oxygen diffusion. This is the reason I recommend not over fertilizing wicking beds, and only adding fertilizer (especially liquid fertilizers) when the water reservoir is full. And the best way of maintaining soil health is not to use fertilizers but to add mature compost on top of the soil layer, under a layer of mulch to prevent the compost from drying out. The soil organisms will carry the compost down into the root zone. I’d be interested in your comments on this – I still have a lot to learn about soil ecology and chemistry. I don’t think pH is a measure of aerobic/anaerobic. Charcoal will be alkalising. There are a range of of diy and commercial pots for air pruning – promoting high air contact to stop roots circling around and getting root bound. This will take some time in a big barrel. Evaporation will be increased with more air flow. Maybe a pro in evaporative cooling the plant+water? It is a bit con if you do not have rainwater. Here the water is 500ppm+ and the transpiration/evaporation leads to super concentration. Coping strategies are i) mulch, ii) flush. Good to get your comments David. As usual, lots of ueful information. We are totally on rainwater here. On a narrow sandstone ridge, seventy metres above any significant creek, and that only flows (sometimes) in years of good rainfall, otherwise it might have an occasional flash flood after a major storm. Hence my interest in wicking pots and beds. Regarding charcoal being alkalising, I want to learn about this because it seems counterintuitive to me. Can you give me an explanation of the chemistry, or point me to a source? Charcoal isn’t exactly biochar, but presumably will have some postivve-ion-binding effect. So, now I just need to find some evidence to prove or disprove my assumption that anaerobic breakdown of any nutrients being carried down to the water reservoir in the wicking pots is likely to create acidic conditions (i.e. excess hydrogen ions) to complete the assessment of this aspect of my justification for using charcoal. In the meantime I’ve made two 20 litre wicking pots (using recycled buckets) with multiple aeration holes in the sides of the upper section to attempt to: a) get more oxygen into the soil to aid in soil food web processes and to achieve some air pruning of roots to stimulate root growth; and b) reduce the water content of the soil to promote root take-up of nutrients (which is reduced in water-logged soils) and to be more suitable for plants which are a bit fussy about wet soils. My trial veg in these pots are eggplants. Re: Air Pruning. This is a very popular method of keeping plants in containers actively growing without getting root bound. Many products on market plus diy’s. Obviously takes time to get bound in a blue barrel. Thanks for you comments David. My thinking about the pH being an (eventual) indicator of an anaerobic situation is that the hydrogen sulphide produced is likely to result a dilute acid, and when I had problems with my first attempt at wicking pots there was plenty of hydrogen sulphide evident when I dug down to the saturated layer. That and my experience with standing water in flooded forests in Sumatra being so acidic that it tasted like dilute vinegar. I’m surprised that you find charcoal alkaline. I’d have expected it to be neutral given that it is only carbon, but maybe there is some pH influence through it attracting ions? Thanks for the explanation of air pruning. Interesting stuff and I am definitely going to follow your practice of putting slits in my wicking barrels. Hi I am the fella with the ABC GA coverage of blue barrel gardens in Alice Springs https://www.facebook.com/daviddevriesinalice. I have been doing wicking beds for 6 years. All shapes. Water sitting around is not optimal. Optimally, the soil is moist and there is no stagnant water. Thus I use the water storage space as a temp storage. 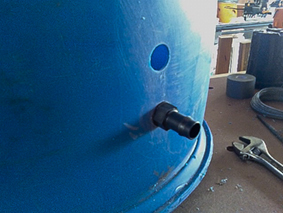 In a half blue barrel fully loaded you may have 40 L of storage space plus another 15L of water in the soil/roots/plants. 5 hot (40C) days later you have 5 L + 15 L and happy plants. 5 hot days later you have 0L + 5L and signs of water stress. 5 hot days later and you have killed everything. I try and keep the water level dynamic. I use soil as the wick and keep it in a flood and drain cycle so that it maintains good biota. I have also begun putting a 8 x 20 mm x 200 mm slits up the sides of the barrel to promote airflow. I have the geotextile right up the interior of the container so that the slits all reveal the fabric. I also place 8 x ribbed lengths of pipe (from washing machines) between each slit to try and achieve an air pruning effect. Other tips. Gravel is a waste of space – it only leaves 30% for the water. Plastic liners don’t last. Go EPDM or containers. Nick Ritar’s article has had a big effect on wicking projects. The first wicking bed he saw was at my place and the next week he built his first and wrote the how to. Meanwhile the design depicted never worked…. Hi David, nice to meet you. I liked your “whole barrel” design on the ABC, with the top half kept as a “frame”. In fact I’ve just got hold of four more blue poly barrels and am going to do the same thing, using the frame top-half as a support for mesh to keep the critters off the veg. Our leafy greens in the wicking puts really get a hammering in mid to late summer from the grasshoppers. I’m in the process of closing off our shade tunnels to keep them out, but we don’t have room for all the wicking pots we want inside the shade tunnels, which is why I need the mesh. “Water sitting around is not optimal. Optimally, the soil is moist and there is no stagnant water.” Yes, totally agree about the stagnant water, but I think there’s a progression from fresh to stagnant that takes some time. Water sitting in the bottom of the pot doesn’t seem to me to be much of a problem on its own. I agree with you about “flood and drain” being important – this is how natural wetlands get their productivity advantage. I generally let my water levels in the wicking pots drop to near empty (checking every day or two days) before refilling. The soil still holds interstitial water when the water reservoir is empty and for some time afterwards, so my plants don’t look stressed immediately the water reservoir is empty. But I think the time between draw-downs and the length of the draw-down are both important, and that it relates to oxygen levels, both in the soil and in the water. I’ve long suspected that one of the possible drawbacks of wicking pots is the oxygen levels, and that was one of my reasons for trying to introduce worms into the pots (with pretty hit and miss success rates, mostly to do with my lack of regular attention to their welfare). I have done some tests with litmus paper on the water in the bottoms of the pots, letting a bit out each day with taps fitted to the pots to check the pH. With the charcoal filler (plus voids created by upturned plant pots) there is no change in pH over a three-week period, and I think this indicates no significant anaerobic by-products, though it probably tells me nothing about the oxygen levels. But I’m still not sure what if anything the charcoal does. Totally agree with you about the gravel. Not only does it take up space, the intestitial spaces are too large to allow wicking unless perhaps one is using pea gravel or smaller, but then that is so closely packed it would take up most of the space where the water should be. Do you find that the slits in the barrels lead to faster drying? It seems to me that this would logically be the case, though the geotextile should retard movement of water vapour to some extent. Even if there is some additional drying, if it promotes oxygen access to the soil it is a good modificaiton. I’m going to try it. I’m not sure what you mean by “air pruning”. Can you explain. To reduce the anaerobic conditions fill the water storage section of the wicking pots or beds with pebbles. Then cover the surface with a permeable material, such as dense shade cloth with a few strings hanging into the water chamber to act as wicks. The compost mix is then placed on top of the shade cloth. Dacron makes good wicks. Also, when water is available, flush the tank with fresh water. Collect the overflow and pour it on to the garden. Thanks for the comment Sue, but I’m not sure exactly which part of your suggested system avoids having the water layer become anaerobic, other than the flushing with fresh water. I’m similarly unsure how my use of charcoal in the water layer might be preventing anaerobic conditions from developing. Water held in a container where there is no close contact with air, and has ongoing addition of nutrients (to the water) will become anaerobic as the process of breakdown of the nutrients by organisms in the water uses up the oxygen. Then the system switches over to favour anaerobic organisms, but the problem then is that the new metabolic processes give off sulphides (rotten egg gas smells – hydrogen sulphide, and even, in my original set-up, creation of shiny black metallic, e.g. iron, sulphides). It has been suggested to me that the small surface area to volume of soil ratio in my barrels was inhibiting oxygen transfer to the soil, in which case something is now making that transfer – maybe worms, which do live happily in the wicking pots if the nutrient supply is kept up, and particularly if there is damp mulch on the soil (this is an important element anyway, as it stops wicking evaporation of the water). When I first added the compost worms I cut the bottoms out of some plastic containers with screw lids and half buried one in each pot, adding a few spoonfulls of vege scraps which had been put through the blender every few days, and this helped to build up the worm population. We have a blender on the kitchen bench for vege scraps, coffee ground and tea leaves, and when full this is blended and goes into our small worm farms which are used mainly for producing worm tea, so it was easy to divert some of this to the wicking pots.